Though the Soviet Union was not ruled by an emperor and declared itself anti-imperialist and a people's democracy, critics argue that it exhibited tendencies common to historic empires. Some scholars hold that the Soviet Union was a hybrid entity containing elements common to both multinational empires and nation states. It has also been argued that the Soviet Union practiced colonialism as did other imperial powers. Maoists argued that the Soviet Union had itself become an imperialist power while maintaining a socialist façade. The penetration of the Soviet influence into the "socialist-leaning countries" was also of the political and ideological kind as rather than getting hold on their economic riches, the Soviet Union pumped enormous amounts of "international assistance" into them in order to secure influence, eventually to the detriment of its own economy. After the dissolution of the Soviet Union, when Russia declared itself successor it recognized $103 billion of Soviet foreign debt while claiming $140 billion of Soviet assets abroad. The Soviet Empire is considered to have included the following states. These countries were the closest allies of the Soviet Union. They were often members of the Comecon, a Soviet-led economic community founded in 1949. In addition, the ones located in Eastern Europe were also members of the Warsaw Pact. They were sometimes called the Eastern bloc in English and were widely viewed as Soviet satellite states. Some communist states were sovereign from the Soviet Union and criticized many policies of the Soviet Union. Relations were often tense, sometimes even to the point of armed conflict. Some countries in the Third World had pro-Soviet governments during the Cold War. 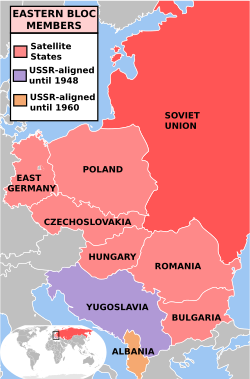 In the political terminology of the Soviet Union, these were "countries moving along the socialist road of development" as opposed to the more advanced "countries of developed socialism", which were mostly located in Eastern Europe, but also included Vietnam and Cuba. They received some aid, either military or economic, from the Soviet Union and were influenced by it to varying degrees. Sometimes, their support for the Soviet Union eventually stopped for various reasons and in some cases the pro-Soviet government lost power while in other cases the same government remained in power, but ended its alliance with the Soviet Union. In addition, Guyana, Tanzania, Portugal and Sri Lanka constitutionally declared themselves to be socialist, even though the Soviet Union never believed them to be "moving toward socialism". The position of Finland was complex. In World War II, Finland had successfully resisted Soviet attack in 1944 and remained in control of most of its territory at the end of the war. Finland also had a market economy, traded on the Western markets and joined the Western currency system. Nevertheless, although Finland was considered neutral, the Finno-Soviet Treaty of 1948 significantly limited the freedom of operation in Finnish foreign policy. It required Finland to defend the Soviet Union from attacks through its territory, which in practice prevented Finland from joining NATO and effectively gave the Soviet Union a veto in Finnish foreign policy. The Soviet Union could thus exercise "imperial" hegemonic power even towards a neutral state. The Paasikivi–Kekkonen doctrine sought to maintain friendly relations with the Soviet Union and extensive bilateral trade developed. In the West, this led to fears of the spread of "Finlandization", where Western allies would no longer reliably support the United States and NATO. ^ Nelly Bekus (2010). Struggle Over Identity: The Official and the Alternative "Belarusianness". p. 4. ^ a b Mark R. Beissinger (2006). "Soviet Empire as 'Family Resemblance'". Slavic Review. 65 (2). 294–303. Bhavna Dave (2007). Kazakhstan: Ethnicity, Language and Power. Abingdon, New York: Routledge. ^ a b Caroe, O. (1953). "Soviet Colonialism in Central Asia". Foreign Affairs. 32 (1): 135–144. JSTOR 20031013. ^ a b Dmitri Trenin (2011). Post-Imperium: A Eurasian Story. Carnegie Endowment for International Peace. p. 144-145. ^ Cornis-Pope, Marcel (2004). History of the Literary Cultures of East-Central Europe: Junctures and disjunctures in the 19th and 20th centuries. John Benjamins. p. 29. ISBN 978-90-272-3452-0. ^ Dawson, Andrew H. (1986). Planning in Eastern Europe. Routledge. p. 295. ISBN 978-0-7099-0863-0. ^ Shin, Gi-Wook (2006). Ethnic nationalism in Korea: genealogy, politics, and legacy. Stanford University Press. p. 94. ISBN 978-0-8047-5408-8. ^ Richard Crockatt (1995). The Fifty Years War: The United States and the Soviet Union in World Politics. London and New York City, New York: Routledge. ISBN 978-0-415-10471-5. ^ "The Empire Strikes Out: Imperial Russia, "National" Identity, and Theories of Empire" (PDF). ^ "Finns Worried About Russian Border". This page was last edited on 8 April 2019, at 00:53 (UTC).